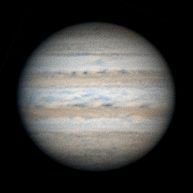 Jupiter night of February 6th while at Opposition. 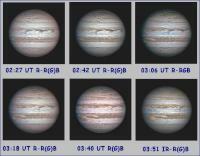 Images of Io and its shadow crossing Jupiter (singing "Io and Myo Shadow") on 28th Dec 2013. IR Image of Io crossing Jupiter. Jupiter Evening of Dec 23rd 2012. 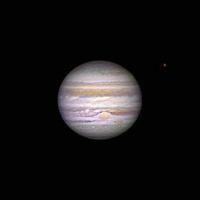 Io is the bright dot to the left of the Great Red Spot. Its shadow is very obvious. Jupiter Evening of 23rd December, 2012. Moons are Io (on the limb) of Jupiter and Ganymede. Jupiter Evening of Dec 12th, 2012. Moon visible is Europa.